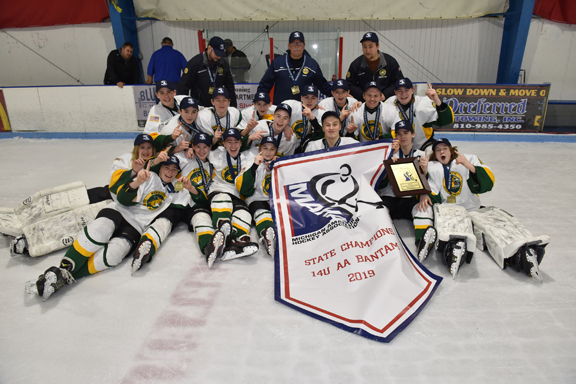 MARQUETTE — Coming off of its 6-0 state tournament victory over Chelsea three weeks ago, the Marquette Junior Wildcats Bantam AA hockey team will venture out Wednesday for South Bend, Indiana. It’s there where the American Legion Post 44-sponsored team will take on the North Jersey Avalanche of New Jersey in its opening game of the 14-and-under Tier II tournament in the USA Hockey National Championships. 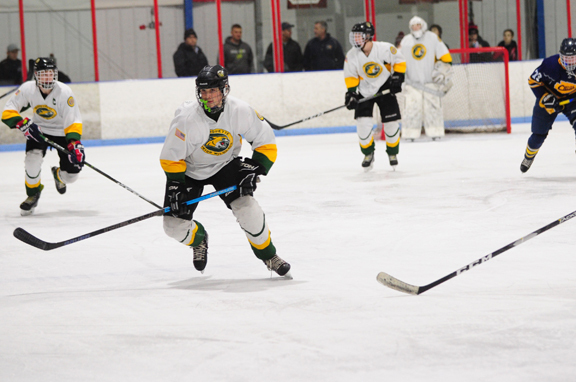 The Legion team is the first Marquette Junior Hockey boys team to win its way to the national tournament in 25 years, according to Legion head coach Jon Nebel. “It hasn’t happened for quite some time for an MJH boys team,” he said. His team did it this year, however, after chalking up a 55-5-2 record and powering its way through the regular season and the Tier II state tournament held in Port Huron from March 8-10. In that tourney, Nebel said he always talked about making it to the final day on Sunday, where anything is possible. “If you look at this group of players, we have six or seven kids from last year’s team,” he said this past weekend. “We were really successful last year with a 47-9 record, but we didn’t make it to the (state tourney) semifinals and finals which are held on Sunday. 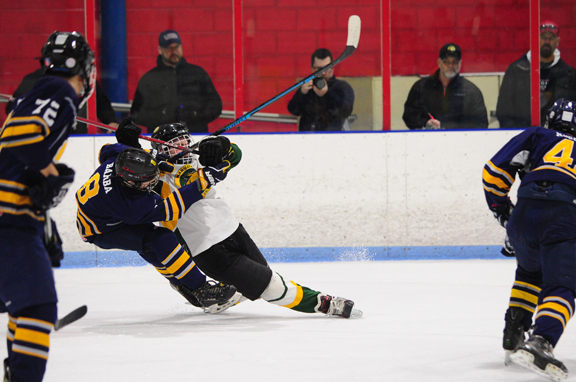 In Marquette’s semifinal game versus Birmingham, the Legion went up 4-1 before the opposition made the score 4-3, forcing Marquette to withstand a furious onslaught in the waning minutes. That they did, cruising to the 6-0 victory right from the get-go. Jack Sides recorded a hat trick, with Drew Dellies, Ethan Phillips and Theo Adams adding one goal apiece as Liam Beerman worked in the net to record the shutout. “I thought Chelsea would be a good matchup for us,” Nebel said. “We were the fresher team, faster team and more physical team. We moved the puck and controlled the game from start to finish. We were able to build on every shift. While the state finale seemed like a breeze, the team had to overcome a bit of adversity shortly after, dealing with the illness bug. “The first week after we got back (from Port Huron), most of our kids were sick,” Nebel said. “It’s a good thing we didn’t get sick while we were down there. We had three practices over the next week and several missing from each practice. The team also played a game on Saturday versus a group of high school players, helping them prepare even more. After three weeks off, the team is trying to balance ice time and rest leading into Thursday’s opening-round contest versus North Jersey. “We’re trying to get that pace up but we don’t want to practice too much at the same time,” Nebel said. “We don’t want them to over-practice and get tired and fatigued. We’re going to make every effort to keep them as fresh as we can. Marquette will compete in Division 3A, which features 16 teams across four pools. Legion will play in Pool A with North Jersey, Mount Lebanon from the Pittsburgh area and Tampa, Florida. The top two teams in each of four pools advance to the bracket round on Sunday, which features quarterfinal and semifinal games before the championship game on Monday. Nebel brushed aside the question about nerves or whether his team is a favorite or an underdog going in, commenting on how every team is similar at this stage of the season. “All you can do is go down there and play your game,” he said. “Every team you see in this tourney is similar to us. Teams that have won their state tournament and have all had successful years. Legion will bring a talented roster with them to the nationals, outscoring opponents 371-90 in 62 games this season. Sides leads the team in scoring with 104 points on 49 goals and 55 assists. Cole Ranta follows with 50 goals and 41 assists for 91 points. AJ Bottari leads the assists category for the team with 61 on the season, adding 24 goals for 85 points. Beerman has played 41 games in goal for Marquette, posting 33 wins and 14 shutouts with a .914 save percentage. Anna Byczek also played 30 games with six shutouts and and an .863 save percentage. Puck drop in Marquette’s opening game versus North Jersey is set for noon Thursday at the Compton Family Ice Arena on the campus of Notre Dame University. The Legion team will play games at 12:15 p.m. Friday and noon Saturday in their attempt to advance. A GoFundMe page has also been setup to help offset travel costs for the team and can be viewed at www.gofundme.com/legionnationals. For more information, visit nationals.usahockey.com or www.mqthockey.org.